Located at Cumberland Bay, New Brunswick, Arrowhead serves First Nations families from several of Canada’s eastern regions. As part of its program ANBC operates summer camping sessions with wholesome sports and recreational activities along with Bible instruction. The Camp offers a Christian atmosphere for all ages to enjoy. Along with an annual Family Camp, First Nations parents send their children to summer sessions where they are under capable supervision. 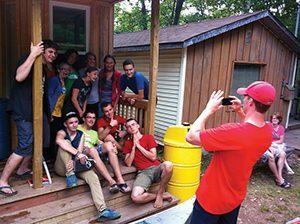 There are also teen-oriented weekend camps in the winter and spring. From Moncton: Head west on the new four lane highway. Take exit #365 and follow the #10 west for 8.3 km where you will take a right turn at the Chipman/Minto exit. You will still be on the #10 west. Follow this road for 16.2 km where you will see a sign marked Cox Point Road and an arrow to the left. Take a left turn here crossing the opposing traffic on to the Cox Point Road. You will drive for a few hundred yards to a “T” in the road, turn left and continue driving down the Cox Point Road until you see the Arrowhead sign on the right and our civic #622. Turn right on to our driveway and come on down. From Fredericton: Head east on the new four lane highway and take exit #347 which heads for Mill Cove and Chipman. You will take route #105 for 13.8 km where you will take a left turn on to route #10 west at the Chipman/Minto exit. Follow the #10 west for 16.2 km where you will see a sign marked Cox Point Road and an arrow to the left. Take a left turn here crossing the opposing traffic on to the Cox Point Road. You will drive for a few hundred yards to a “T” in the road, turn left and continue driving down the Cox Point Road until you see the Arrowhead sign on the right and our civic #622. Turn right on to our driveway and come on down. From Chipman: Head east on highway #10 and go about 15 km and make a right turn on to the Cox Point Road. Follow the Cox Point Road until you see the Arrowhead sign on the right and our civic #622. Turn right on to our driveway and come on down. Ministering at Arrowhead during one of our summer camps is both challenging and rewarding. If you would like to come and serve with us, please write or call.